above Mark Gardener with the Mail's racist columnist, Richard Littlejohn. We have written before about the Communist Security Thugs (Trust). This is a trust whose annual income last year £6.6m and the year before was £5.7m. After doing a bit of research, we have identified 78 Jewish charities which made donations to the CST in the year 2006. 14 of them didn't specify in their accounts how much they contributed but of the 64 who do, a grand total of £529,800, i.e. less than 10% of overall income. Assuming that the other 14 charities contributed another £100,000 there is no indication in the accounts as to who their most substantive donors are. We should therefore assume that much of this money is either corporate funding and/or donations from Zionist groups directly. The association of Gerald Ronson of Heron Group, the richest private limited company in Britain, might offer one clue and likewise the association of Stanley Kalms of Dixons/Curry's is another. The Jewish Chronicle has previously highlighted how the CST is one of the most opaque of Jewish charities, revealing as little as possible. It has only one listed trustee, a corporate company and quite uniquely is given a dispensation by the Charity Commission from having to reveal its funding sources. Fundraising costs at the CST rose from £561,302 to £785,636, a rise of 40% and over 10% of income. A considerable amount for any charity. What is of more concern is the number of well paid employees. In particular the accounts reveal that 3 were paid between £60,000 and £70,000, 1 between £70,000 and £80,000, 1 between £80,000 and £90,000 and one between £120,000 and £130,000. One can assume that their main, indeed only spokesperson, Mark Gardener, is the person paid £120,000+. Never has fighting racism and anti-Semitism been so profitable!! Unfortunately most of us who spent our lives fighting fascism have not been similarly rewarded. But then CST isn’t in the business of fighting fascism or racism, its main concern is fighting anti-Zionism and labelling it anti-Semitism. Total salaries ['governance] for 2007 were £2,063,000. Profits in last 5 years were £1.4m, £1.1m, £1.1m, £1.4m, £1.2m. There is little doubt that CST’s main role, apart from fighting anti-Zionism is to act as a gravy train for Gardener and his friends. And a very lucrative gravy train it is too. It is clear that CST have made special appeals to all Jewish charities, no doubt laying emphasis on the ‘rise’ in anti-Semitic incidents and how CST are the dyke holding back the tide of anti-Semitism. With this selling point they have been bleeding Jewish charities dry. At the same time as guilt tripping Jewish charities to give them money, the most basic social welfare facilities of the Jewish community are being left to wither on the vine as the community declines in numbers and grows older as Jewish charities face a serious lack of funds, as anyone who has had a relative stay e.g. in a Jewish old people’s home will testify. Whilst the old and poor in the Jewish community go without, the CST is living it up with millions held on 'reserve' and in the bank and whilst paying fat cat salaries to Gardener and his mates. In short the CST is a parasite on the Jewish community, using the bogy of anti-Semitism, which they have an interest in blowing out of all proportions, as the means of levering these funds. Below are the charities that we have been able to locate which have been tricked into giving CST their money. Below is the experience of 2 Jewish activists, Deborah Fink & Naomi Wimborne-Idrissi, of Jews for Boycotting Israeli Goods, of harassment by the Community Security Thugs, whose alleged remit is to prevent ‘anti-Semitic’ attacks on the Jewish community. As can be seen, their real role is to innoculate the Jewish community from anti-Zionists and non-Zionists such as Jews for Justice for Palestinians and the Jewish Socialists Group. I have also had some run-ins with them, notably when I was leafletting at the Independent Jewish Voices first public meeting on Monday 19th February I was targetted by 2 of their thugs for giving out leaflets inside Hampstead Town Hall and was manhandled. It would be interesting to know how anti-Zionist Jewish leaflets are ‘anti-Semitic’ even according to their loose definition. 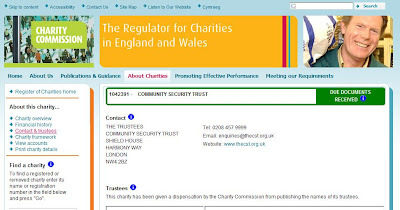 It is clear that the Community Security Trust is hiding behind its charitable status in order to acts as the internal policing arm of the Zionist Federation in Britain. As such its activities are anything but charitable and the question of these thugs charitable status will be the subject of a complaint to the Charity Commission. Earlier in the year, JfJfP had met with the CST, having been stopped from giving out JfJfP leaflets at Jewish Book Week. As it seemed that the CST had not honoured their agreement not to stop us leafleting, JfJfP wrote to them on my behalf about this incident, and the CST apparently apologised, though I never saw this apology. This was the report JfJfP enclosed in their complaint. ‘Today at 3.45pm, outside the Wigmore Hall, an older female friend and myself started to give out leaflets containing events and information, which we thought would be of interest and concern to people attending the co-existence concert. A man from the CST asked to see the leaflet and then ordered us to stop giving them out on the grounds that it was on a sensitive issue. We offered to move further down the road, but this was not accepted. Although he claimed to be non political, his objection was purely political and indicated a position not actually shared by the promoters of the concert, the New Israel Fund. Considering that the job of the CST is to protect internal security, I do not see how our leafleting on a public highway, was any of his business - he is not policeman. As it was, leaflets were accepted graciously by the audience, some of whom came back for more. I went to a panel discussion where one of the questions was on the academic boycott of Israel. There were anti-boycott leaflets on the seats. After the meeting, a CST member saw me give one of the panel, Anthony Julius, a ‘Jews for Boycotting Israeli Goods’ (J-BIG) leaflet and told me I could not leaflet in there. I said that I was not leafleting as such, to which he replied that he saw me give out leaflets. All I had done, was given a couple of interested people, and then an opponent (Julius), my J-BIG leaflets, after the meeting. It was irrelevant to him that there were anti-boycott leaflets on the seats. Again I pointed out that this was political censorship and that they did not own the building or run the event. The CST then asked me to leave which I refused- I was doing nothing wrong –so they then demanded to search my bag, even though the event was over. I have witnesses to this. Naomi Wimbourne-Idrissi, a calm and unthreatening woman of 56 and I, were hoping to attend a meeting on Gaza here, organised by Liberal Judaism. We arrived shortly after the meeting began, having not been given clear details about the location of the venue which had been changed from the Montagu Centre. We were genuinely interested in listening and possibly asking some questions and had no intention of being disruptive. Why would we be? I knew one of the panellists and knew it would be a balanced discussion. Since we had previously been at a vigil in Parliament Square, Naomi was carrying the Jews for Boycotting Israeli goods (J-BIG) banner and poles in her bags. While waiting for me, she approached the CST men in a friendly fashion, saying she would like to park the poles somewhere before going into the hall as she did not want them with her at the meeting. They asked how she’d heard of the meeting and she said she'd read about it on Rabbi Rich's website. They asked if her name was on the list and she said she understood her friend's name plus one had been put on it in advance by a rabbi friend of mine. While she waited for me, they said they would have to search her bag and she drew their attention at once to the banner, which she said she would also like to leave outside with the poles. They immediately said "You can't go in". She explained again that she wanted to leave the banner and poles outside and didn't see that they had the right to stop her attending an important discussion, but they were adamant that they had decided and that was it. When I arrived, I told them that my name had been put on the list, which was then confirmed, but the CST continued to deny us entry and threatened us with the police. I pointed out to them, that they don't own the building, it was not their meeting and they aren't police, so what right did they have to order us not to go in? They even blocked the stairway so I could not go down! Naomi then went to ask the building reception staff if they could provide a place to leave the banner and poles. They said that as long as she was allowed into the meeting they could put them in a locked store room for her. But this made no difference to the CST men who were now saying that the banner was not the issue – I could not go in! So first it was the banner, then it was my attendance that was the issue! They sneered when they said my name and talked to me in a condescending manner and so had obviously heard of me. Indeed, they might have records on me. A police officer then arrived and a colleague of Rabbi Rich's came out. Alarmed by the fracas she decided to uphold the CST decision, which was unfortunate given that it would not have occurred without their determination from the start to bar us as soon as they worked out that we were activists. It turns out that the CST had lied to the police officer, (and no doubt to the organisers), telling him that we intended to unfurl the banner inside the hall (although they had no idea what kind of banner it was, and despite Naomi’s desire to leave it outside). Apparently they told him that they had had dealings with me before. 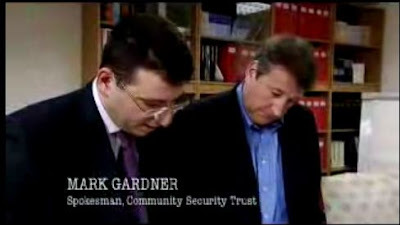 On Wednesday 3rd February 2009, I gate-crashed a talk given to the Union of Jewish Students (UJS) at Hillel House by Mark Gardner, the smooth talking, seemingly friendly, Head of Communications of the Community Security Trust (CST). It was part of their ‘Campus campaign training’ programme for ‘Campus activists’ entitled Debating, Analysing arguments and subtitled, ‘Creating a strong argument and ripping your opponent to shreds’. I would say that the talk did not really live up to how it had been described, other than the aggressive element – we were encouraged to be physically violent towards Fascists, (not pro-israel ones, I suspect!). Much of it was vague, shallow waffle, full of contradictions and little substance, but the gist of it seemed to me to be, how to lie to the media. He then seemed to encourage us to agree with our opponents as a tactic - and I think this was what he was later doing with me. He went onto discuss the issue of the behaviour of the spokesperson. People are not going to believe him if he is evasive, shifty and a liar.. Gardner joked that the CST employs him as people believe a Scottish accent and that spokesmen should appear rational and reasonable...(Like him, I presume.....). Next, Gardner reported the increase in anti-semitic attacks since the Gaza onslaught and asked how we might respond if the media rang us. So far, I had been sitting quietly at the back but was now wondering if I should use this as an opportunity to introduce Jewish students to another perspective. Gardner actually asked,"How about someone from the back?" so I answered that yes, it is bad that there have been attacks but that it is not surprising given that Israel claims to speak for all Jews. Gardner wrote my point down but I don’t think he really wanted to go into it too deeply. After getting other responses he asked, what do we mean by an anti-Semitic incident, (though he never answered that); is Israel to blame and how should Jewish students react? He suggested that we "focus on anti-Semitic impact rather than the intent" and answered his second question with,"It's not Israel's [fault], it's the fault of anti-Semites. It's the fault of the sort of people who can't distinguish between Jew and Israel." And who’s fault is that? Apologists for Israel often conflate Zionism with Judaism and even conflate Israeli with Jew, as in ‘when they say boycott Israeli goods, they mean Jewish goods’....But now Gardner was voicing the same complaint that Jewish critics of Israel do! I jumped in saying that Israel is not to blame, but it does not help and I recounted how Olmert and Sharon claimed that they were doing this for all Jews. I then added that the Board of Deputies claimed that the Jewish community supported the attacks on Lebanon and Gaza. In their defence, Gardner said their rally "was a call for Peace and for an end to conflict, unlike all the other demonstrations which called for Hamas to win." I disagreed and said, "I was there"....This caught him by surprise. So far, he had tolerated my views and said they were different to what people were used to in here but that it was good that I voiced them. Now, I seemed to be part of the enemy camp. He had lost his friendly, calm manner and was now on the defensive. "But Galloway likened Gaza to the Warsaw ghetto", as if that had anything to do with his previous point. "Well, so have I". He called it morally and historically bankrupt and replied saying, "You’re in the wrong building".....Hang on, didn’t he say that the UJS represents Jewish students? Not ones with my opinion, it seems, but then we always knew that.....I replied, "But I’m Jewish!" I then explained that there had been a 2 year siege before the onslaught. As I didn’t think I’d get the chance to ask another question and their pizzas would get cold (! ), I decided to do one of the things I’d set out to do: expose the CST and while I was at it, the UJS. I asked if the UJS represented Jews critical of Israel, then went into a rant about how the CST don’t protect all Jews and how they stopped myself and a friend going to a meeting. I pointed out how Gardner told the ‘independent on Sunday’ that the CST don’t keep records of attacks within the Jewish community. He denied this, even though it is on the Independent web site, and said there are no records...! Yet the ‘Independent on Sunday’ actually listed a few such attacks. After the meeting, I challenged Gardner, without initially, revealing my identity. He said he knew nothing about the incident whereby a couple of activists were stopped from leafleting outside Wigmore Hall. Funny, as not only had I written to the CST about this very recently, JfJfP had actually complained to them about it at the time. I then described how two activists had been stopped from going to a meeting. Before realising who I was, Gardner told me I’d got it wrong. Then I got the same nonsense that he, (yes, it was him) sent me in his anonymous emails, about it being because of my behaviour that they did not let me in and that they might have indeed let Naomi Wimborne-Idrissi in after all had it not been for me! He said that they were not discriminating against us for our views as they had people in there with all sorts of views....But then he said that when they caught sight of her banner with the words ‘Israel’ and ‘End the’ (not that these words are on the J-BIG banner!) they thought she might be a trouble-maker! (She really looks like one....not!). Hang on, he had just said that there were all sorts of views represented at the meeting, and, not forgetting that Naomi had been given permission to leave the banner outside! I also pointed out how the CST did not protect the Jewish protestor who had disrupted the Chief Rabbi’s speech at the rally, and did nothing about the man who had thrown ice at him. His response was to say "The police were there". Not really the point. It did not stop them pulling the protester out of the fountain. Couldn’t the police have done that? Great post, Tony. It's good to have all this info about the CST collated in one place. 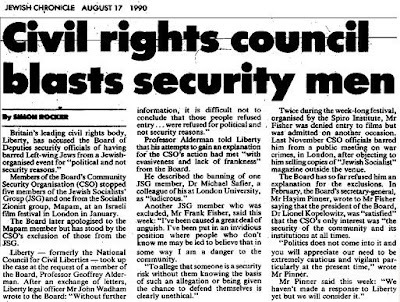 I was intrigued by Geoffrey Alderman's defence of the JSG's rights back in 1990, despite his right-wing Zionism. You recognise antisemitism when YOU are the victim but not when the CST tries to protect OTHER victims. The CST does a great job and we are lucky to have it. Apparently I'm a hypocrite for condemning anti-Semitism against myself but not against others. Of course, if that were true then the charge would be correct. I rarely speak about anti-Semitism against myself because my primary experience of it is from Zionists and people whose politics are closely associated with the CST! I don't accept that the CST does anything to combat anti-Semitism. Rather it seeks to conflate anti-Semitism and anti-Zionism in order to help prop up the 'Jewish' State. In so doing it actually makes the incidence of anti-Semitism worse because crying wolf is a good way that people will become immune to the genuine article. I have also been intrigued by Geoffrey Alderman and his journey to the right. In the late 1970's from everything I know he wasn't a right-wing Zionist. On the contrary he resigned from the Board of Deputies to hisses and boos. He was called the 'communal gadfly' by the Jewish Chronicle. He not only defended the JSC but also criticised the Board of Deputies for their attacks on the Anti-Nazi League, when it was a genuine mass popular movement. I believe he had a sea change, not sure why, but now he is the poor male relation of Mad Mel P with whose column his own appears in the JC. He also wrote an excellent book, The Jewish Community in British Politics, which leading Zionists tried to persuade him to suppress for its information about Jews voting for the National Front in the 1974 General Elections. "I don't accept that the CST does anything to combat anti-Semitism"
Well the fact that they document it is a pretty good start. "What gets measured gets managed". It is much easier to register an AS incident with them than with the police and anyway the police do not separate antisemitism from other forms of racism. The problem is that they don't document anti-semitic attacks because they deliberately confuse them with anti-Zionist or pro-Palestinian incidents. Someone shouting 'free Gaza' when someone Jewish is in earshot is likely to have the incident classified as 'anti-Semitic'. I don't agree that anti-Semitism can be 'managed' but if it good the point above is equally valid. I'm not sure that it is a good idea to separate out anti-Semitic from other forms of racism. That suggests it is a special case and the Police in Manchester and London do, I understand, separate them out. Given the predominance of anti-Muslim racism (even the BNP has been protesting at alleged attacks against Jews over Gaza!) I think it would be much better to stick to what we can all agree as anti-Semitism - attacks on Jews because they are Jews not attacks on Israel because it calls itself Jewish. "Someone shouting 'free Gaza' when someone Jewish is in earshot is likely to have the incident classified as 'anti-Semitic'." And just because you don't think that denying the Jews a State is not antisemitic doesn't mean it isn't. There is an internationally acceted definition that confirms that it is. That's the definition of the word 'definition' - it isn't like a smorgasbord from which you can pick and choose. Well yes, it is rubbish that someone shouting ‘free Gaza’ or ‘stop Israeli war criminals’ in the earshot of someone who is Jewish should have that classified as an anti-Semitic incident. But you need to take up this conflation of anti-Zionism and anti-Semitism with the Community Security Thugs, not me! And just because I deny that Jews are entitled to their own state doesn’t mean it isn’t anti-Semitic. I agree. It’s not anti-Semitic because it was the anti-Semites who were the most vociferous supporters of Jews having a state. It was they who said that Jews didn’t belong where they lived but in a separate, racial-ethnic state! And of course the anti-Semites and Zionists did make common cause. Who welcomed Theodore Herzl’s ‘Der Judenstaat’ [Jewish State] pamphlet? Not the Jews. When the Zionist Congress first proposed to meet in 1897 they chose Munich as their meeting place. The Jewish community was outraged and petitioned to have the meeting banned. They saw it as a ploy of the anti-Semites. Because as Herzl himself wrote in his memoirs: ‘“the anti-Semites will be our most dependable friends... our allies.” Hence why he sought a favourable review of Der Judenstaat from the premier anti-Semite of the day in France, Eduard Drumont, editor of the anti-Semitic paper, La Libre Parole. So if you are calling for a Jewish state. Fine, but you’re in the company of anti-Semites. Hence why the BNP are Israel’s most avid supporters today. Tony's problem with the CST is similar to mine - that they might be documenting something but it isn't antisemitism. And this is frustrating. There may well have been an increase in antisemitism (I'd say there has) over the last few years - but when the antisemitism is conflated with antizionism by the politically (and as Tony shows, economically) motivated folks in the CST, it's impossible to tell. Geoffrey Alderman sounds more and more fascinating. He might have defended the ANL in the '70s but recently he was attacking those who fought in Cable Street, indicating a complete about turn. He still maintains his independence - managing to attack both the Board of Deputies and IJV in some Guardian article last year. George Orwell once described Rudyard Kipling as maintaining a rugged independence from the ruling classes, while imbibing and being one of the most effective disseminators of their ideology. Maybe the same thing is going on here. Interesting post. The Issue isnt solely with the CST though. The community in general does not like to hear alternative points of view. The CST, UJS and Board of Deputies are representative bodies of the Jewish community. UJS and BoD are democratically elected bodies and i advise someone with these views to go through the proper structures to voice your opinion. Throwing a hissyfit when you refuse to be part of the structures is cowardly. If you have something to voice then i suggest you either go to your J-Soc or your Synagogue council and voice it. If your unwilling to do this then just shut up with the moaning. Tch, tch. You mustn't tell people, not least the blog owner, to shut up with their moaning. Free speech is all about moaning - not that I was moaning. In fact whatever the Board of Deputies is it certainly isn't democratic. I refer e.g. to the following comments on the 'somethingJewish' web site. 'But behind the Board lies an undemocratic and unelected organisation that claims to speak for all Jews when it fact it speaks for itself claiming to be in the best interests of Anglo-Jewry. I could refer you to the book by ex-Jewish radical now reactionary, Geoffrey Alderman in his excellent book The Jewish Community in British Politics which caused a stir when it came out about 25 years ago. Fact is that the BoD has more rotten boroughs than a Victorian Parliament. Old Sarum was nothing compared to its pocket boroughs. Synagogues which don't exist but which send delegates. As for the UJS. There have been a number of articles and letters in the Jewish Chronicle about its lack of democracy, not even publishnig the figures of who received what votes in its annual elections. There is a very sparse participation by Jewish students in this ZIonist front organisation, funded by Israel to make propaganda for it on campuses. So if I went through the 'proper structures' I'd get lost in a thicket of bribes, nods and winks. I prefer open politics thanks. The CST isn't elected anyway but what it is is a sponge and bloodsucker on what is an ageing and declining Jewish population. As young people marry out there is noone to provide the funds for the elderly in care homes like that which my grandmother died, the appalling Stapley in Liverpool. Far better to stuff Mark Gardener's mouth with gold to find anti-semitism where there is none and to confuse that which does exist with anti-Zionism. The other problem of the BoD is that it doesn't represent secular Jewry (or ultra orthodox come to that). Up to half British Jews are on the way out of the community because it is narrow, insular and Israel obsessed. Your post unfortunately, whether you mean it or not, plays into the hands of the BoD by suggesting people use the very means by which they keep control. I prefer open criticism. Sorry. 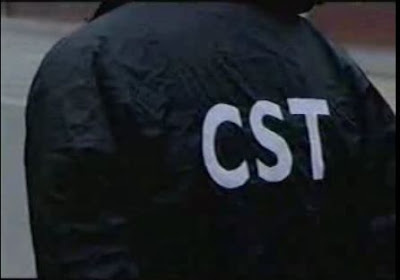 The CST represent themselves as representing the Jewish Community on security matters. In fact they are self appointed & represent no one but their own opinions. If anyone dares challenge them they tend to get quite nasty! The only community to get things right for once is the orthodox jewish community who simply dont allow the cst into their buildings nor do they allow the cst to put up their notices on their notice boards! The CST does not in any way shape or form represent the Jewish community, it is a totally stand alone charity that hides behind over 50 overt & covert cctv cameras in its HQ, Shield House, Harmony Way Hendon. It may supply services to the community but there is a big difference between supplying a service and representing the whole of British Jewry which they claim to do! They clearly do not represent anyone other than their own opinion and the opinion of their secret and anonymous trustees. They have a significant monitoring dept that monitors anti Jewish groups such as neo Nazis & Islamic fundamentalists and this is their excuse for secrecy. I think they over estimate their importance. There are rumours that they may do a little more monitoring than the law allows and if anyone can verity either way please let us know? I understand that the top two salaries are in fact for Mr Richard Benson and Miss Carol Laser and that Mr Gardner is no 3! Why a charity has to be so secretive is one question but how the government funds such a secretive charity is a far more serious issue? Hate crime reporting is another sore point. Most of UK’s Jewish community do not want to use the CST for hate crime reporting so why have they received a £50,000 pa grant from the home office to run a hate crime reporting phone line when the Jewish community trust police and other than the very orthodox everyone is happy to call police directly. In any event the Very orthodox don’t like the CST and tend to call shomrim if anything but definitely do not call the CST. Zionist Weapons Cache Found in Synagogue!! !